At the center, courtyard and private parking, 2 bedrooms, veranda, relax; sea at 150 mt. "Passion Marinara" (x info: 3337168401) is a very nice and bright apartment, each room has a window, bathroom included and all windows overlook green and wooded areas, including the terrace-veranda where you can enjoy a beautiful view on the west side of the village. The entrance to the villa is independent, it is accessed by a gate that opens electrically from inside the apartment or outside with keys, it gives on a rectangular courtyard of about 6 square meters. where you can comfortably park bicycles and strollers. Also present a tap that can be used once back from the beach. The stairs leading to the apartment; they are comfortable, so much so that even the youngest children can easily climb them. The furniture and the environments are treated in detail, with fresh and delicate tones that recall the marine style and that will not give you that feeling of having set foot in a sterile and cold environment, as often happens when you rent a house for the holidays, but rather, to have found a cozy and warm nest. It consists of a living room, kitchenette, two bedrooms with two large wardrobes, one double and the other double with the possibility of obtaining a double bed, bathroom with shower, toilet, bidet, washing machine, hairdryer. The kitchen is equipped with an electric oven, a four-burner gas hob, a fridge with a small freezer, a television, kitchen utensils, crockery, cookware and so on. The beds have all the slats and the mattresses are very comfortable, in the living room there is a comfortable sofa bed. Present safe, air conditioner and heating system with natural gas. From the living area there is access to the covered terrace which is equipped with rain - sun curtains that guarantee the habitability even in case of rain. On the terrace you will find a table for 4/6 people and garden chairs where you can have lunch and / or dinner, as well as a tap for cleaning the house. Also the window of the second bedroom and the bathroom has an outdoor awning that allows constant ventilation and refreshment to the whole room. The house is very bright and the view of the landscape and the garden below infuse a sense of tranquility and well-being in all those who live there. The accommodation for its location is functional for all types of holiday, not just summer and is suitable for both children and people of all ages. It lends itself well to a stay that will allow you to enjoy the beauty of this territory rich in history, quality food and wine tours (Verdicchio, Rosso Piceno, Rosso Conero, the oil routes) and unique and enchanting landscapes. The apartment is on the first floor of the terraced house consisting of two apartments (the other apartment is on the ground floor and is published on Homelidays announcement No. 6595464) both with separate and independent entrances. La Villetta is located in the central area in the seaside town of Marcelli di Numana. A few meters from the house you can reach on foot; bars, convivial or gastronomic restaurants, weekly market, supermarket, minimarket, bakeries, ice cream parlors, industrial laundry, bathing establishments, and so on. Near the house there are also bus and bus stops made available free of charge by the Municipality of Numana to reach all the establishments even the most distant and the center of Numana. Although the house is located in the central area, its location is very quiet as it is located in a small residence surrounded by trees and gardens that protect privacy and silence. Access to this area is allowed only to residents through an electric gate that protects their safety. The apartment has a parking space located within the residence, clearly visible from the apartment, so you can park your car on your arrival and resume on the day of departure. You can easily take advantage of the nearby beaches; the sea is 150 meters from the house (five minutes walk) l the road to reach the beaches is convenient and easy and near the house you can use both free beaches (there are two) or if you want those equipped (ce they are different and they all have a bar and some even a pizzeria-restaurant or play areas for children). In the months from June to August possibility to take the ferry that leads to the beaches of the two sisters directly from the factory n. 22 which is 150 meters from the house. The owners of dogs can entertain their four-legged friends c / o the municipal sgambatoio 150 meters from the house. I am a middle-aged woman, I love life, travelling, meeting people and cultures, I put my lovely house at your disposal to make your holiday perfect! This home is the result of the desire for freedom, carefree and living surrounded by all that is pleasant and comfortable. We have furnished and cared for in every detail and "bring it to the heart". In this house we spent joyful and carefree moments with family, friends. A holiday here can not do you that good, your mind and your body will come out regenerated and your heart will be grateful! Furnished with care and personality in the smallest details, bright, very quiet and relaxing, isolated from the noise of the neighbors (the apartment enjoys a special isolation), surrounded by greenery; suitable for couples, families, with a private courtyard; Terrace; parking space in the private parking lot owned by the house. You do not need the car to reach the sea or to go shopping or a walk, the sea, the services, the square, the bars and the restaurants of the village are there .... a few steps away. The bathroom has a window and is furnished with bathroom furniture and a large mirror. use of air conditioning and final apartment cleaning are included in the price! go for it! On Easter Sunday and at the Easter Monday here in Marcelli, the Spring fair is held. Our house is close to all services, you can get there on foot without the hassle of taking a car or looking for parking. TO KNOW: You can not accommodate people, not declared at the time of booking. Animals should not be left alone at home, only clean and well-behaved small and medium-sized dogs are accepted. Eine schön und komplett mit viel Liebe eingerichtete FeWo. Strand in zwei Minuten, Geschäfte und Restaurants und Pizzerien auch. Sehr ruhige und trotzdem zentrale Lage. Auch ideal für Städtebesichtigungen von Marken. Die Inhaber sehr nett und sehr freundlich - Prospekte und Infos in der Wohnung. Empfehlung: In Marcelli gibt es die Adresse Via del Conero 15 (merkwürdige Strassenführung) zwei Mal (!) und die Navi zeigt die Adresse in Außenbezirk an! Die FeWo ist jedoch in der Innenstadt. Um die problemlos zu finden sollte man in Navi "Ecke Via del Conero / via Trieste" angeben und in der Ecke dann rechts Via Conero etwa 150 m folgen. Auf der linken Seite ist dann die Nr. 15. Es ist ein geschlossene Domaine mit etwa 8 -10 Häuser. Die FeWo hat auch die Nr. 15! Appartamento pulitissimo e conforme alla descrizione, per la prima volta non ho dovuto ripulire il bagno, cucina e cassetti armadio! La biancheria profumava di pulito ed il copriletto (solitamente una delle cose piu' puzzolenti) era in perfetto ordine, lavato e stirato!Posizione comodissima ed allo stesso tempo tranquilla per riposare. Ivana e suo marito gentilissimi e disponibili. E' la prima volta che scrivo una recensione........ma sono felice di descriverne una positivissima per un appartamento a Marcelli di Numana dove sono stata in vacanza con la mia famiglia marito e i nostri due figli di 11 e 13 anni. Marcelli....un piccolo ma accogliente paesino che costeggia il mare del Conero. 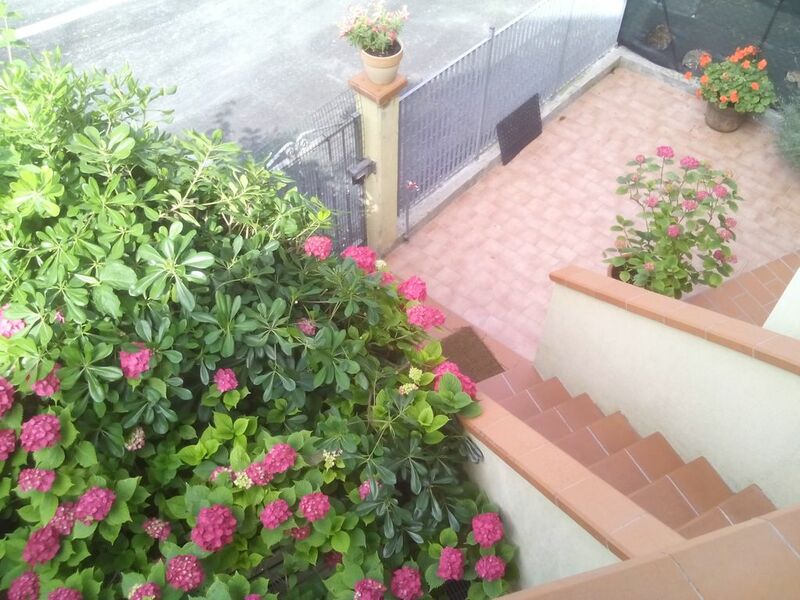 Innanzi tutto faccio i complimenti ai proprietari della casa...Ivan e Raffaele che curano l'appartamento come un gioiello, pulitissimo, ordinato e con tutto ciò che serve a una famiglia che si vuole sentire a casa propria Entrando in casa si respira subito aria di mare.....tanti piccoli particolari, mobili bianchi, oggettistica marina ampi spazi....e stupefacente balcone dove noi facevamo colazione e cenavamo dopo una giornata trascorsa nelle belle spiagge ai piedi del Monte Conero....dal terrazzo un bellissimo e rilassante panorama. Ivana e Raffaele due persone squisite che ci hanno accolto calorosamente e ci hanno consigliato le gite da poter fare nelle due settimane di permanenza a Marcelli (visto che ra la prima volta che andavamo). Paesini davvero incantevoli...Loreto, Offagna, Porto Recanati, Castelfidardo...ecc...La villetta è vicino al mare....spiaggia libera dove ci sono bar e ristorantini. Direi che è stata un'esperienza davvero positiva, potrei stare qui ore a descrivere tutte le cose belle e piacevoli che abbiamo vissuto....ma secondo me l'ideale è provare a trascorrere almeno una settimana in questa incantevole località.....in questo favoloso appartamento!!!!! Grazie a Raffaele e Ivana. Morena e Maurizio. Bologna. Abbiamo soggionato con due bambini, casa nuova dotata di ogni confort, camere spaziose con comodi materassi, ampio terrazzo dove cenare, bagno con lavatrice, posto auto condominiale. La strada è chiusa con un cancello e i bambini potevano liberamente andare in bicicletta o giocare a pallone. La spiaggia e il supermercato sono a cinque minuti a piedi, anche se consiglio di girare un po tra Numana e Sirolo perchè ci sono tantissime spiagge. La proprietaria Sig ra Ivana è molto gentile e sempre disponibile. "Passione Marinara" is located in the center of Marcelli, a seaside resort of Numana. It is a town characterized by a stretch of thin gravel and golden sand about 6 km long with every service from restaurants to sports facilities, ideal for children and families. The district of Numana has 47 bathing establishments and several free beaches, one of which is dedicated to our 4-legged friends. Le chiavi vi saranno consegnate dal proprietario, VERY IMPORTANT: The day of check in; the owner give you the keys.Bed linen and towels are not included, the cost is €. 20 for double bed; €. 10 for single bed; towels €. 10 per person and every time you change, or you can bring your.